In the heat of the moment a life long bachelor loses his heart. Can she rescue his soul before he asks for it back? 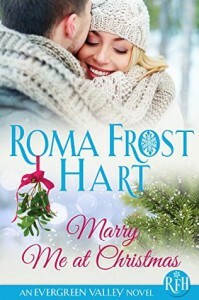 Marry Me at Christmas puts a little holiday in your heart. Business is the deciding factor for two desperate people. Both want to save their businesses from ruin, so they enter into an agreement. Marriage. Only this conveniently, temporary arrangement is starting to look more like a inconveniently, permanent heartache. Will it be a happy ending or a broken heart for this unexpected love story? Bently and Venus are the sweetest greeting card for this time of year.